It won Best New Comedy at the 2015 Laurence Olivier Awards; The Play That Goes Wrong was first performed in 2012 at The Old Red Lion Pub in Islington, creating hilarity with audiences ever since. The Mouse Trap was funny but Jonathan, Dennis, Sandra, Annie, Max, Robert, Chris, and Trevor manage to present ‘The Cornley Polytechnic Drama Society ‘production of a 1920s murder mystery, a love betrayal that ends with murder even more comically. From the start in which an ill-fated stage manager struggles to secure a broken mantelpiece and co-opts an audience member to hold it, before the play begins. A tell tale sign that things are not as they should be. This was indeed the case, anything that could go wrong did just that as these thespians battle through all adversities, theatrical paradox, disintegrating sets to dropped lines and a host of other catastrophes including a revived corpse. The cast ingeniously performed with meticulousness diligence, precision timing physical jest, whilst engaging the audience at every level in laugh till you cry moments. It was quite extraordinary just how they continue to sustain the yarn throughout the performance; even when you guessed what might happen, it was still hard not to laugh out loud. Nigel Hook’s set creation which collapsed well on cue, as the play unfolds was astonishing, at times audience members hiding their eyes in fear of a miss-hap remarkably no one was injured a authentic feat of stage management while Mark Bell (Director) and (Producer) Digby Robinson accomplished a technical triumph. Don’t miss this hilarious farcical slapstick sketch comedy from beginning to end. 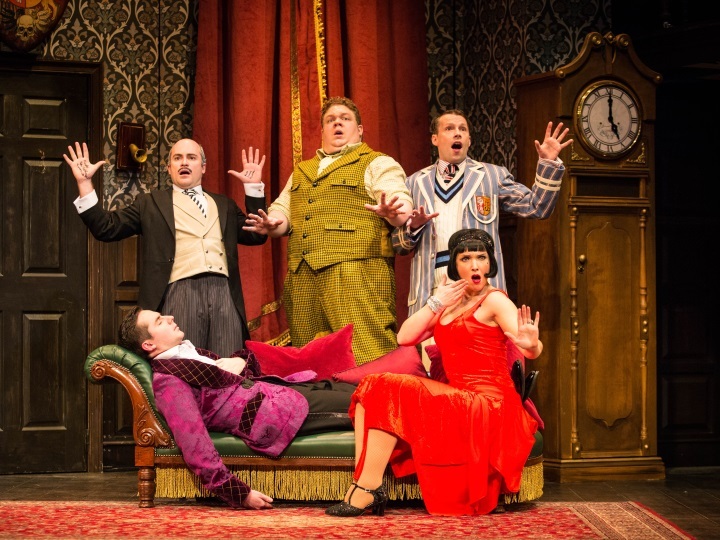 The Play That Goes Wrong is at Milton Keynes Theatre a limited run until Saturday 18th March 2017. Tickets can be purchased at www.atgtickets.com/miltonkeynes (bkg fee) or by calling their Box Office on 0844 871 7652.